A few weeks ago, the ladies of Winelandia got together to make some cookies. It’s true they’re cookies, but they’re also our favorite cookies, and an easy way to create something that will make someone in your life feel special. 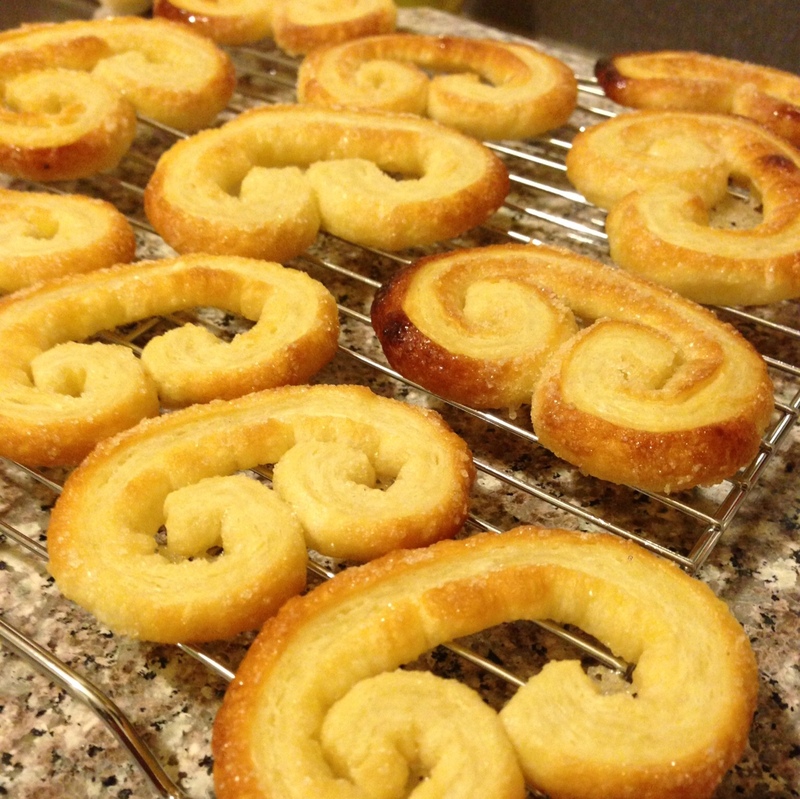 Palmiers are also called Elephant Ear cookies, among other names, and they’re made with puff pastry. While I did make my own puff pastry from scratch, you don’t have to in order to produce a successful palmier – just buy a batch of the good stuff from your local market. DuFour is the best brand I’ve tried from stores, but some local bakeries in the San Francisco area will also sell their own. I know Downtown Bakery in Healdsburg does, for example. 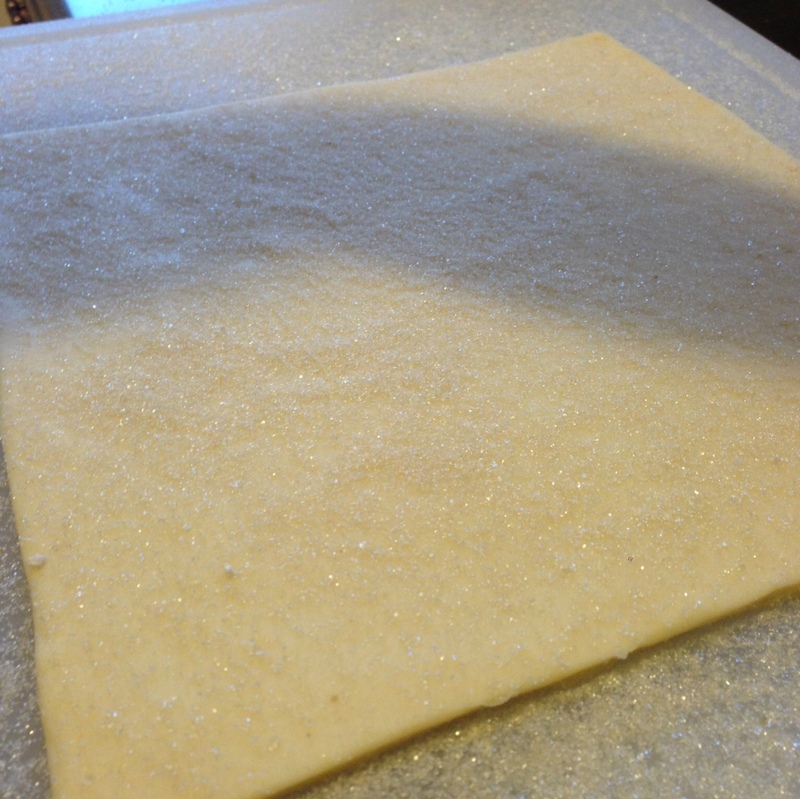 Puff pastry, whether you buy it or make it, will come in some kind of a rectangle shape, like this. I needed to measure mine to make sure what I was starting with was the right size. Check out all these layers! This batch was made according to the great Rose Levy Beranbaum‘s specifications, and it has 7 turns, which results in 2187 total layers. It took about 5 hours to make. 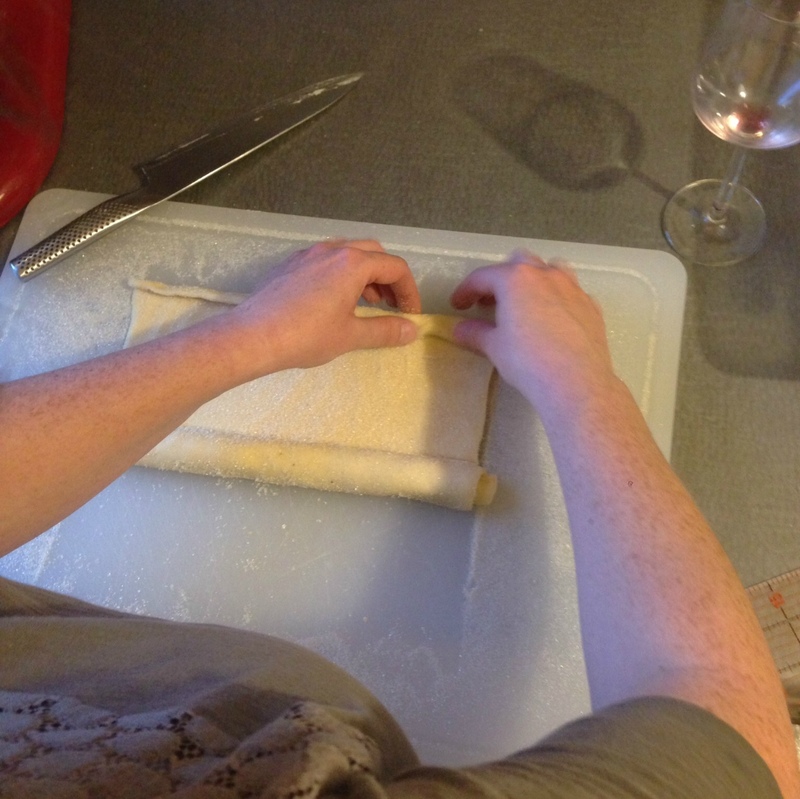 So anyway, you need to roll your sheet of puff pastry out to a very large, relatively thin piece of dough. Many recipes have specifications for how big, but honestly I think the thinner the better, by and large. 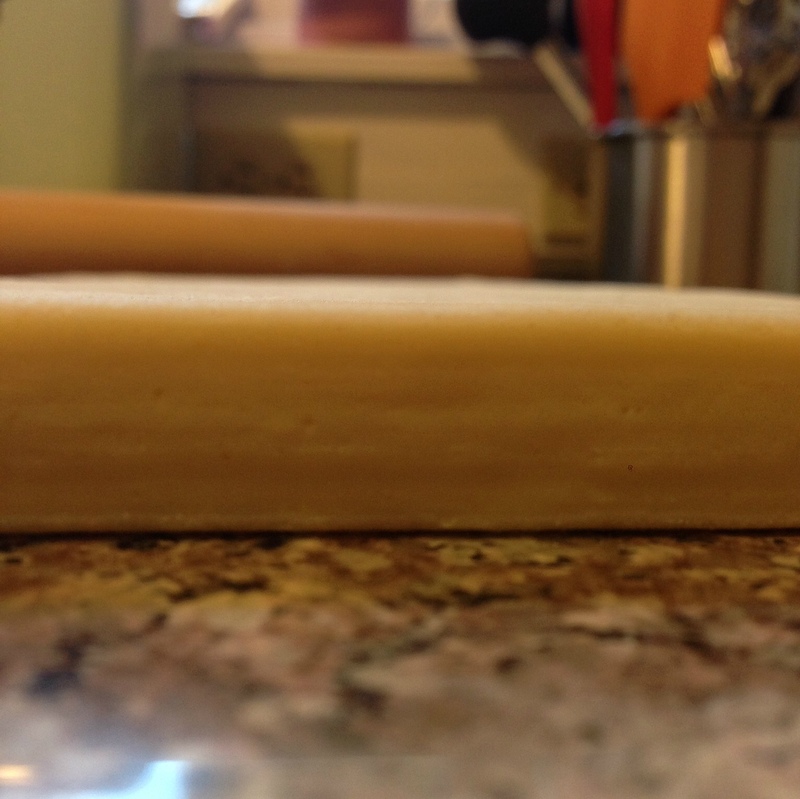 I’d say somewhere around 1/8″ thick is perfect, which is how thick your pie crust should be if you’ve ever made pie. Before you begin rolling, spring your work surface with white sugar – maybe 1/4 cup. Then, lay your rectangle of dough down, and sprinkle the surface with another 1/4 cup of sugar. Once both sides are coated, you’ll roll the sugar into the dough, which will help it be incorporated into the cookie and caramelize with the butter in the dough. Try to keep the edges even. Once you’ve made a nice thin rectangle with sugar rolled into both sides, you’ll roll or fold the whole thing up from each side. I measured my dough and made a rough mark in the center so I knew where to stop. It doesn’t have to be perfect, and like I said, you can roll or fold it. Rolling will give you a rounder cookie, but you can start with maybe a 1/2″ flap and fold it inward toward the center, which will give you more of a heart-shape. 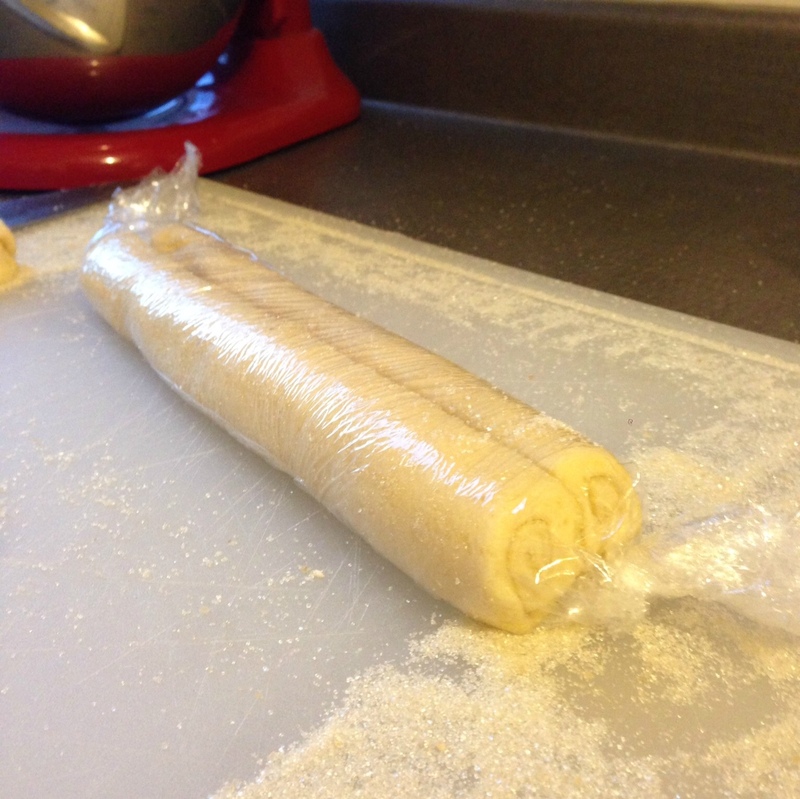 When you finish rolling it together, wrap the log in plastic wrap and refrigerate it for an hour or so. You want it to firm up before baking. 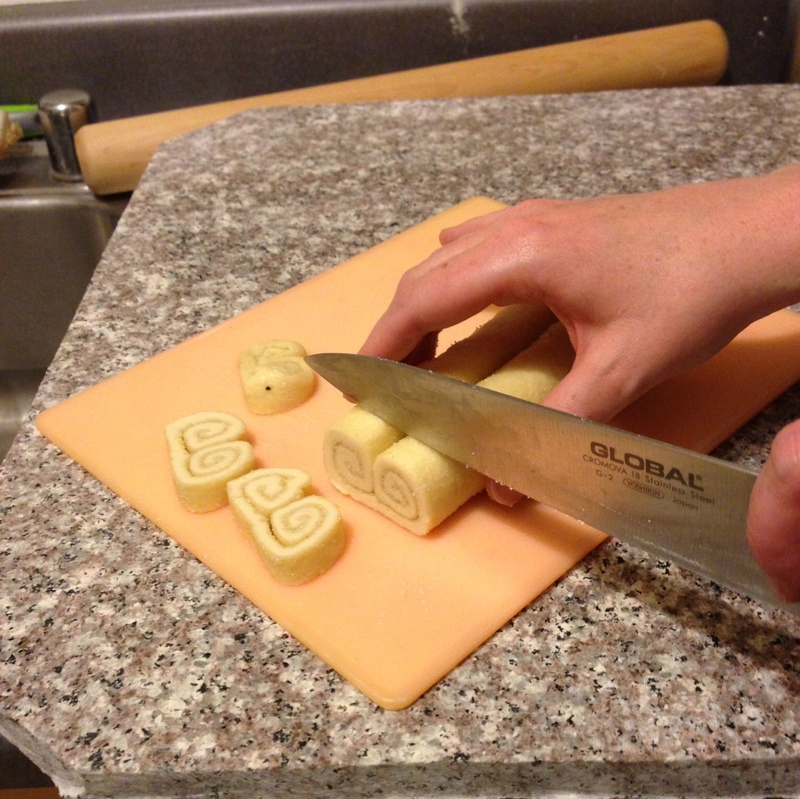 After an hour in the fridge, take your log out, unwrap it, and slice it into 1/4″-1/2″ slices. 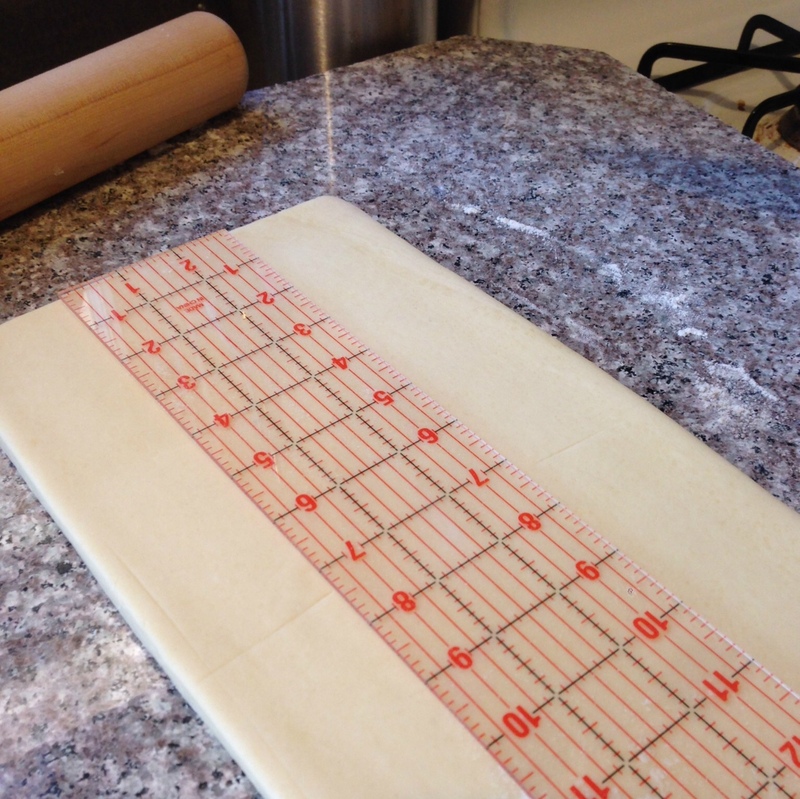 Puff pastry expands a great deal, so even if they look small and thin, you will be rewarded in the end. Lay the cookies out on a cookie sheet covered with parchment or with a silicone liner, leaving plenty of space between them for expansion. Slide the trays into the oven for about 10-15 minutes, or until the edges are golden brown and delicious looking. Cool them on a wire rack and enjoy! Once upon a time, long, long ago, I went to the City of Lights – Paris, France – and ate one of the finest meals of my life. I barely spoke any French but managed to order the duck breast at Les Enfants Perdus in the 10th arrondissement. It came with a lovely purée of parsnips and a light salad. It was simple, beautiful and delicious. It’s been about a year since my last trip to Paris and this Sunday I am leaving for Italy & Spain. I thought I’d get myself in the mood for food by re-creating that amazing meal at home. Here’s how I did it. 2. Toss the cored parsnip quarters in a bowl with salt and a long pour of olive oil. 4. Arrange the parsnips on a cookie sheet (with foil for easier cleanup) and bake for 15 minutes. 5. While the parsnips are roasting, score your duck breast skin with the tip of a sharp knife. Cut through the skin and fat, but not into the meat. This will help the fat render out from underneath the skin and make the skin crispy. 6. Turn your roasted parsnips, then put them back into the oven for another 10-15 minutes. They don’t take long to cook, so be careful not to burn them. They are done when a knife slides easily into the thickest part. 7. When your parsnips are done roasting (they should look like the photo below), put them into a food processor or use a stick blender to purée them. Throw in a couple tablespoons of unsalted butter or olive oil to help them along. Purée until creamy. Use a little bit of stock to loosen up the mixture if it’s too thick. Taste and adjust salt if needed. Cover and put in a warm spot. 7. 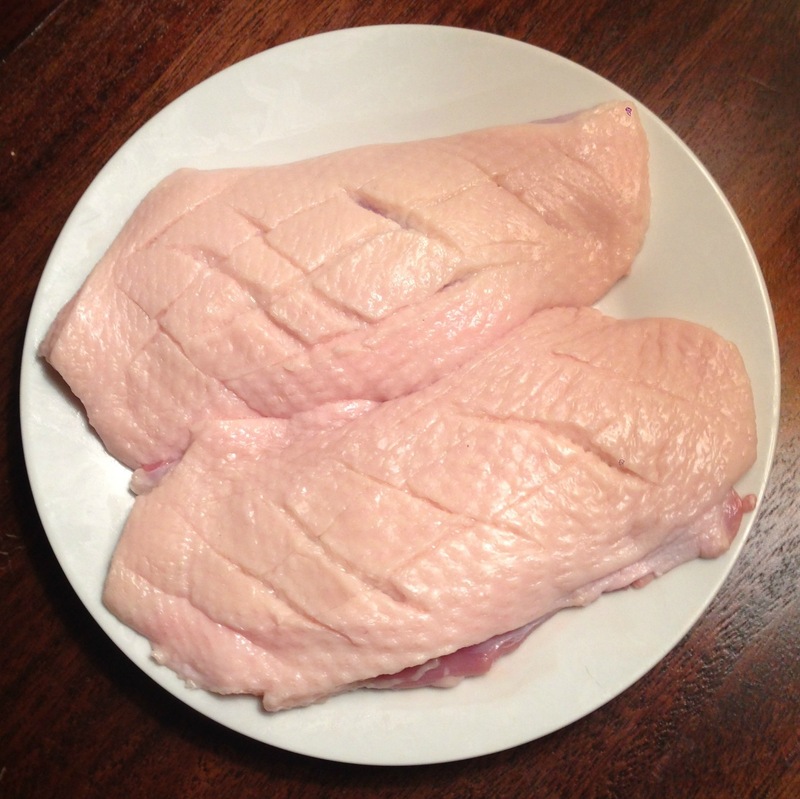 Pat the duck breasts dry with a paper towel, then season with salt and pepper on both sides. 8. Heat up a stainless steel skillet over medium-high heat until it’s pretty darn hot but not burn-anything-that-touches-it hot. If you flick some water at it, the droplets should sizzle and bounce around. Once hot, lay down your duck breasts skin-side down. Don’t use oil, the fat in the duck skin will render out and create more than you need. Once the skin starts to turn golden (about 5 minutes), drain the fat in the pan off into a jar (you can use this for cooking later, and never pour fat into your drain), turn the heat down to medium-low, and slowly render out the rest of the fat until the skin is a deep golden brown, another 7-9 minutes or so. 9. Turn the head back up to medium-high. Flip the duck breasts so they are meat-side down. Cook for another 3-5 minutes or until medium-rare or medium. Don’t overcook them. 10. Remove duck breasts from the pan to a warm plate in a warm place, and let them rest for a couple of minutes. Don’t cover them, the skin will lose it’s crispness. 11. Drain the fat off the pan into a jar and save for later use. 12. Next, toss your minced shallots and a couple of sprigs of thyme into the hot pan that you cooked the duck in. Cook these over medium heat for about a minute, scraping up the fond as you go, and then pour a cup or more of white wine into the pan and reduce by 2/3. It should look like it’s boiling ever so slightly, otherwise it will take forever to reduce. Continue to scrape up any fond in the pan, it’s packed with flavor. Pour in any juices that have leaked out of the duck that’s resting on the plate. Once the pan sauce is reduced, turn off the heat and toss in a tablespoon or more of butter. Melt the butter into the sauce and strain the whole shebang into a small jar. 13. Next, make your salad dressing. Pour equal parts champagne vinegar and olive oil into a small jar with a lid. Add some salt & pepper, then put the lid on and shake it up. Put your arugula into a bowl and pour the dressing over it, then toss. 14. Time to plate! 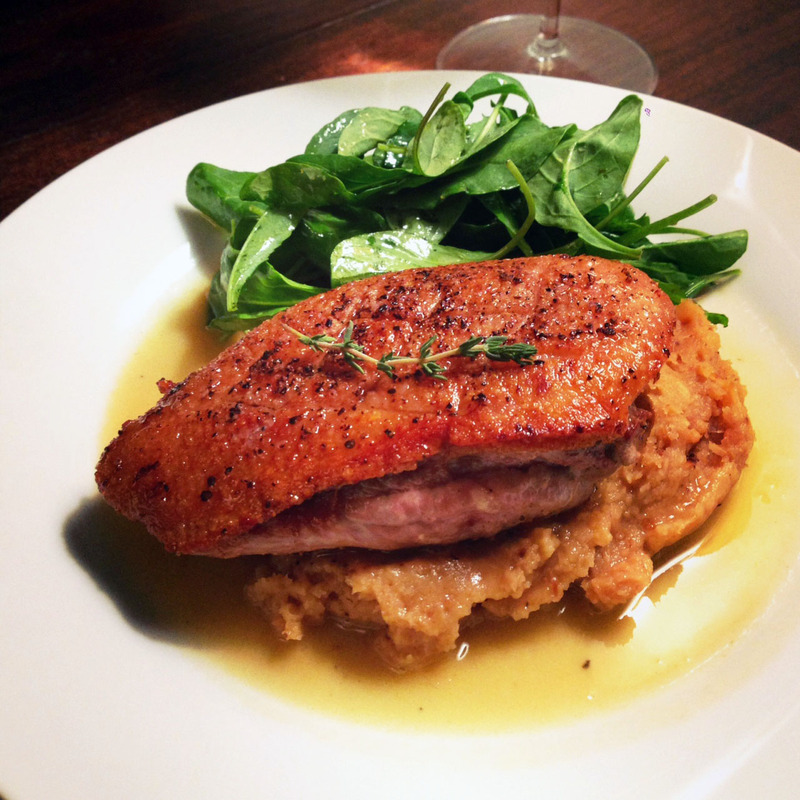 Put a big scoop of roasted parsnip purée onto a plate and then lay the duck breast over it. Lay a sprig of thyme over the duck breast as a garnish. Put a handful of the dressed salad next to it. Now, pour some of that delicious pan sauce you made around the parsnip purée but try to keep it out of your salad. Voila! Delicious, Paris-inspired meal. You can make it even better by pairing the perfect wine with it. I paired a really nice Arbois Chardonnay by Jacques Puffeney (2010) – $26 from Arlequin Wine Merchant in San Francisco. This wine is slightly oxidative but still really fresh and food-friendly. Jura wines are some of the best food-wines I have come across. Alternatively you could pair it with a nice Burgundy or even a domestic Pinot Noir. Have fun with it! A good wine pairing should make both the food and the wine taste better than they do by themselves. 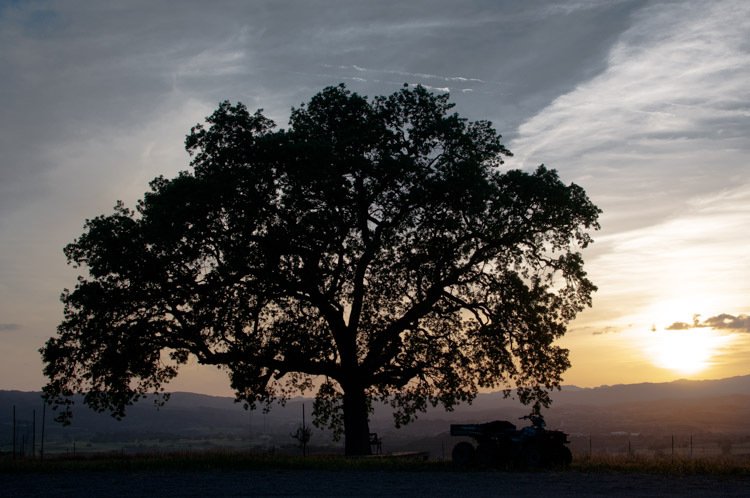 Nestled in the hills on the Eastside of the Paso Robles AVA, right in the path of the winds from the Templeton gap, lies a 1000 case-per-year production Organic & certified Biodynamic winery. The owners – Philip & Mary Hart – are two of the nicest people you’ll ever meet. They purchased the land in 2001 and planted their 20 acres in 2004. 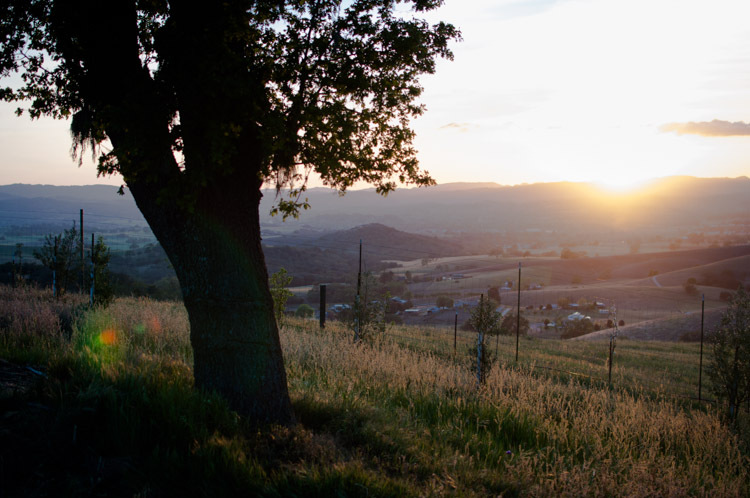 They grow Grenache Blanc, Viognier, Marsanne, Roussanne, Syrah, Mourvedre, Grenache, Counoise, Sangiovese & Tempranillo. 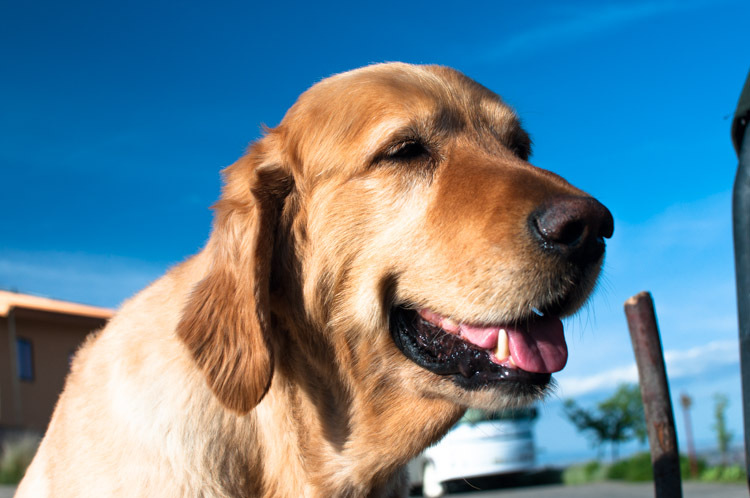 In addition to grape vines, they grow olive trees from which they produce their own Organic olive oil and raise 2 cows, 2 sheep, 25 chickens, 2 dogs and 7 cats. 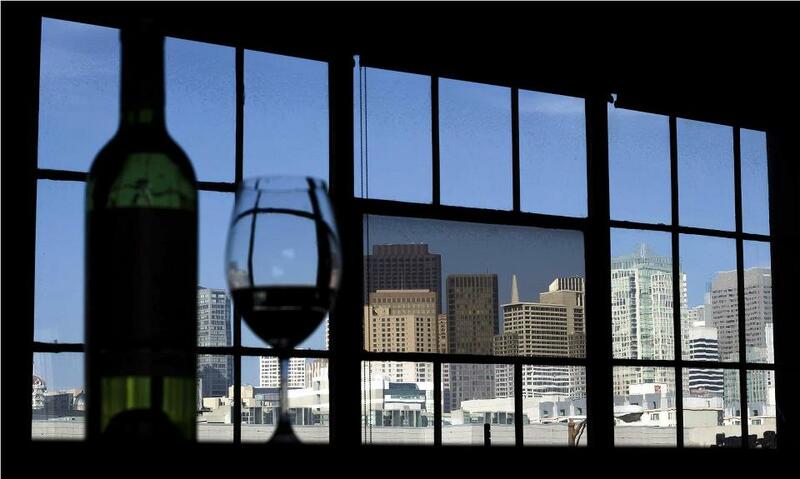 Colleen & I first met Philip’s assistant, Frederic Ballario, at the 2013 Rhone Rangers industry tasting in San Francisco. We always stop by the AmByth table at this event because we so rarely get a chance to go down to the Paso area. It’s always exciting to try their new wines since we love the style of them. They are the polar opposite of most Paso wines; they are lean, low in alcohol, unmanipulated and completely natural. 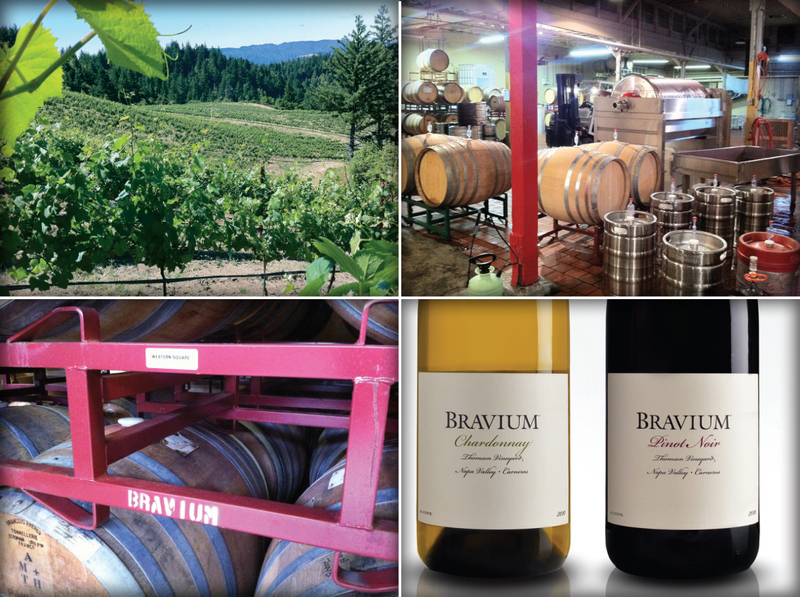 I was very excited to see some new wines from them, including a now sold-out skin-fermented Grenache Blanc (aka “orange wine”) and a red table blend from the 2011 vintage. Colleen and I spent some time chatting with Frederic and we immediately loved him for his warmth, knowledge, energy and friendliness. A most serendipitous thing happened a few days after the Rhone Rangers event. Frederic and I ran into each other at another wine tasting and he told me they needed someone to represent the winery at an event at K&L (who now carries their wines). He asked if I was available to pour wines for them for a couple of hours (I was) and subsequently he invited me down to the winery to go over their winemaking practices, teach me a little about Biodynamics and to get to know the processes a little better so I could better represent them at the tasting. So, I packed up my Husband/Software Engineer/Photographer and headed South to AmByth Estate. Upon arrival, I was lucky enough to get to taste through their entire line-up of wines. Right now they have about 8 wines available; a Viognier, a white Rhone blend, a few red Rhone blends, a Syrah, a red table wine, a Zinfandel and a Tempranillo (which is drinking superbly right now). Frederic spent some time talking about their latest winemaking practices and equipment while showing me around the facility. 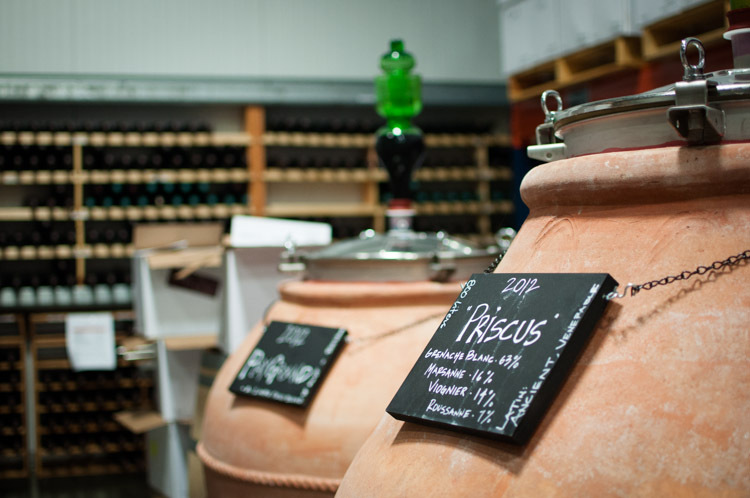 AmByth recently purchased several amphorae which are now filled with fermenting wines, shown below. We cleaned the strangely beautiful green glass airlocks attached to the amphorae and tasted through all of them, most of which were still either full of CO2, in the middle of MLF or still under primary fermentation (in April!). I am particularly excited to try their wines produced in amphorae. I have never actually seen one of these in person before this and they are quite beautiful. All of them were hand-made in Italy. The climate is very unique at AmByth Estate. In the summer, it can be 100F and higher, but it cools down to about 50F at night because of the cool marine wind coming through the Templeton Gap. This temperature swing and wind preserves the acid in the grapes and produces wines which are much fresher, nervy, full of energy and great with food. In addition to the balancing acidity in these wines, they are made with minimal or no SO2 and are built for the long haul. These wines drink great when they are young but I anticipate they will keep on giving for years and years to come. 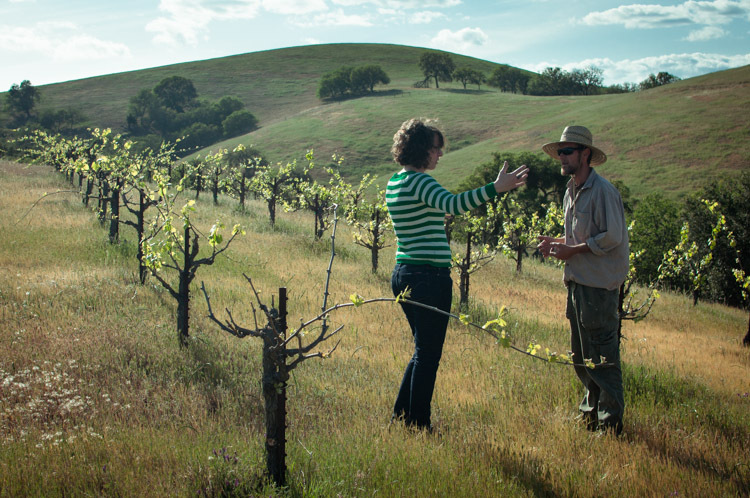 I asked Frederic a lot about Biodynamics as I really don’t know a whole lot about it other than it’s a pretty hard-core natural farming and winemaking process. He explained to me like this: Biodynamics help facilitate the flow of energy between the earth and the sky (or ‘cosmos’, as he put it). The moon, sun & earth all have natural cycles and Biodynamics help the system function to it’s full potential. Their belief is that good winemaking happens in the vineyard; the grapes need to be their best for the wines to follow suit. In the winery, little is done. They use 100% native yeast, minimal intervention and very little SO2 (none as of the 2012 vintage). 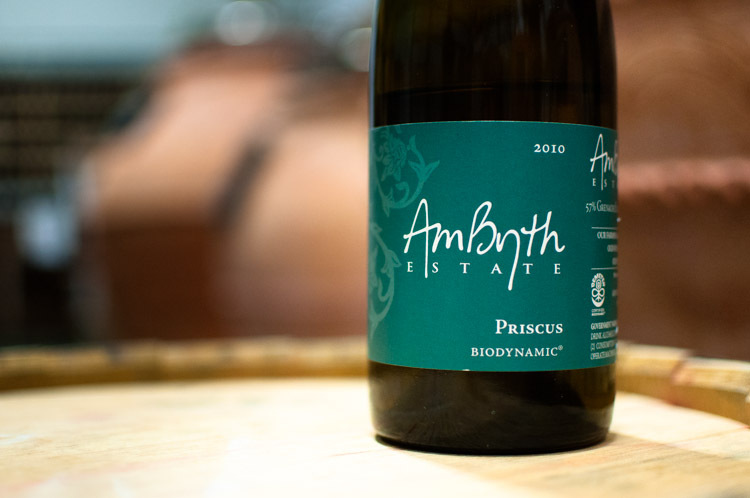 The resulting wines speak to the fact that Biodynamics really do produce something unique, super-natural, and very different from conventional wines. I am truly humbled by the generosity and warm hospitality from Frederic during our stay. I really encourage all of our readers to make a trip to Paso specifically to visit this winery. It’s really something special in a sea of mediocrity. 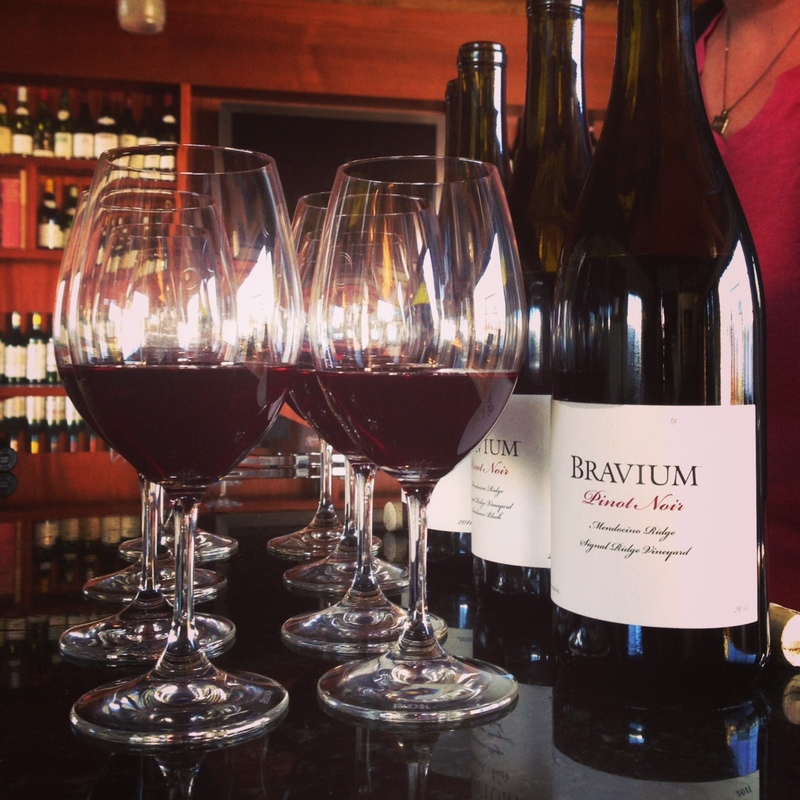 If you are unable to make the trip to see them, you can come to K&L Wine Merchants in Redwood City this Friday, April 12th from 5PM to 7PM to taste their Syrah and Red Table Blend. Yours truly will be pouring that night so come by and say hi. There will be 3 or so other wineries also doing tastings and the fee (I believe) is $10. If you have any questions, please let us know in the comments. If you’re anything like me, you love brunch. You love it specifically because it provides a valid excuse to go out and eat poached eggs. They are delicate, fresh-tasting, healthy and satisfying. If you’re anything like me, you have spent countless hours trying to perfect this technique at home only to have your attempts explode into a water-logged, filamentous mess. 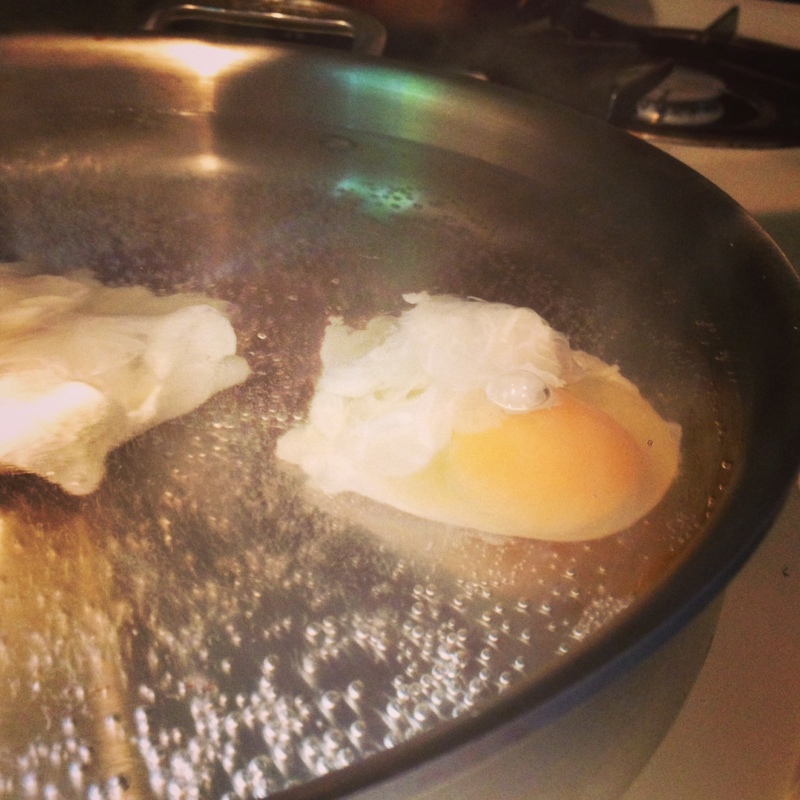 Through much trial and error, I finally came up with the easiest and most fool-proof method of poaching eggs. In my opinion, it’s easier than frying an egg and healthier too. No oil or butter, no cracked yolk, no hard-cooked nastiness. 1. Your eggs must be HELLA fresh. I am talking, right-out-of-the-chicken fresh. 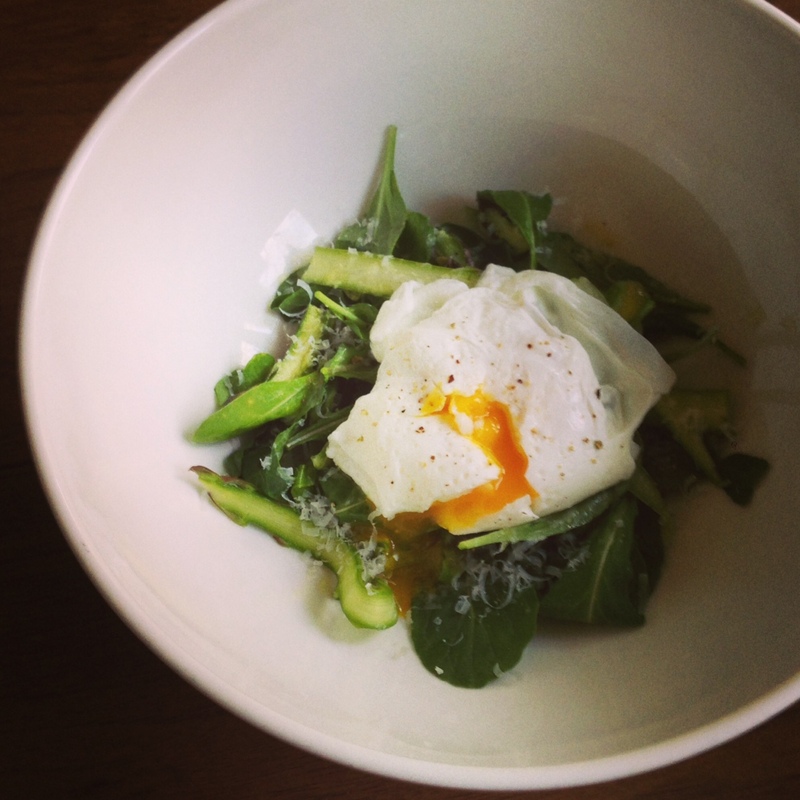 The older your eggs are, the runnier the whites will be and the harder it will be to poach them. You can determine how fresh your eggs are here. 2. Vinegar in the cooking water helps keep the white of the egg “tight” and keeps it from exploding. 3. You don’t want to plop the egg into the hot water; you need to lower it gently within a container other than the shell and gently DISPLACE the egg into the pan from the container with water. 4. You don’t want your water to boil hard or to create a “whirlpool” in the pot of hot water. While I’m sure someone, somewhere is able to poach an egg like this, I never have been able to and find that it just makes things really difficult. I hope that this tutorial demystifies the process for you and helps you achieve perfectly cooked, tender, just-runny enough goodness. 1. Fill your tall-sided skillet or shallow pot with 2-3 inches of water. 2. Bring your water to a simmer. You should see lots of small bubbles and a few big bubbles (see photo). 3. Add a couple tablespoons of vinegar and a large pinch of salt to the hot water. 4. 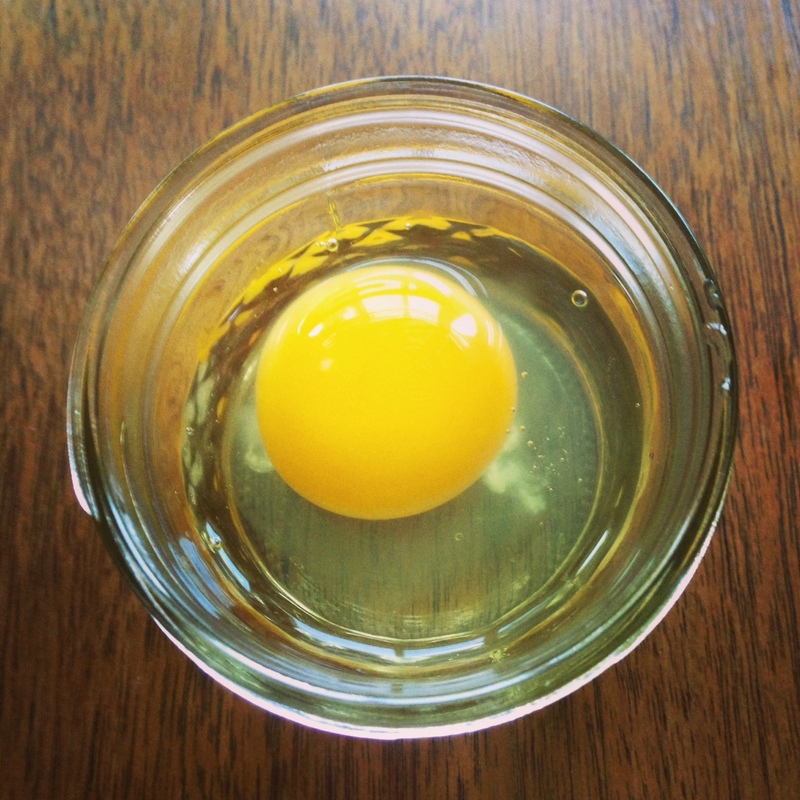 Crack your extremely fresh egg into your 4 oz canning jar, ladle or bowl. 5. 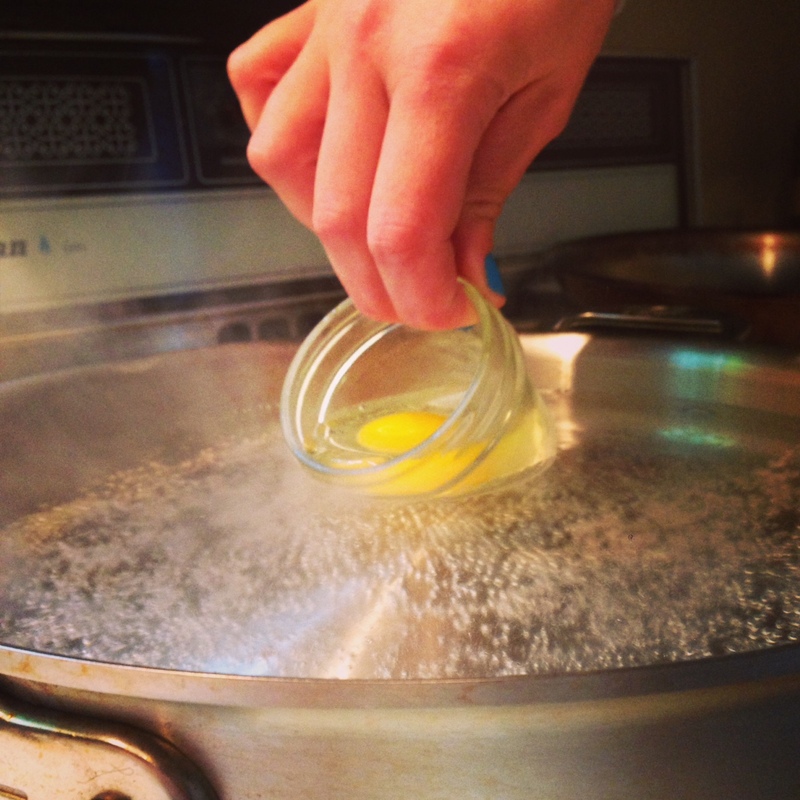 Gently lower the jar/ladle/bowl into the hot water and displace the egg from the container with the water. 6. Repeat steps 4 and 5 until you reach the total number of eggs you want to eat (but don’t crowd them). 7. Set your kitchen timer for 3 minutes (soft cooked) or 3.5 minutes (medium cooked). We don’t poach eggs hard around here. 8. Gently remove the egg from the hot water with a slotted spoon and put on whatever vehicle you have chosen for your eggs. 9. Throw some shaved aged parmesan, chopped parsley, sea salt & pepper on there for a truly exquisite brunch. Skip the hollandaise sauce if you want to live a long and healthy life. That’s it! Enjoy new skill.